Insulin-like growth factor 1 (IGF-1) enhances pain signaling by way of voltage-gated calcium channels, reports a study published October 7 in Science Signaling. Led by Jin Tao of the Medical College of Soochow University, Suzhou, China, researchers found an atypical mode of IGF-1 signaling that resulted in enhanced currents through Cav3.2 channels, also known as T-type channels. Interfering with this pathway attenuated hypersensitivity to touch and heat in mice with inflammatory pain. The results add another dial to the dashboard for modulating Cav3.2, a prime target for new analgesics. Previous work has found that ubiquitination and glycosylation alter Cav3.2 channel trafficking, ultimately affecting the number of channels in the neuronal membrane available for conveying pain signals (Garcia-Caballero et al., 2014; Orestes et al., 2013). In contrast, the modulation by IGF-1 worked on the biophysical properties of the channel itself, and may offer a faster, more transient way of controlling Cav3.2 channel function. “Any protein that is heavily regulated like this tends to be really important,” said Gerald Zamponi of the University of Calgary, Canada, who wrote an accompanying perspective on the study. Earlier this year, Zamponi and colleagues found the connection between ubiquitination and Cav3.2 channel activity (see PRF related news story). “This study is another good example where T-type channels are highlighted as a critical player in pain signaling,” he added. The research was inspired by earlier reports that IGF-1, a growth factor made in the liver that promotes nerve growth and metabolic function, could also bring about pain in animals and humans (Miura et al., 2011; Mohamed-Ali and Pinkney, 2002). In the new study, Tao and colleagues found IGF-1 receptors in dorsal root ganglion (DRG) neurons that convey pain signals from the periphery to the spinal cord. They showed that activating these receptors led to increased currents through Cav3.2 channels, hyperexcitability of the neurons, and hypersensitivity to touch and heat in mice whose paws had been injected with IGF-1. The results suggest that interfering with the IGF-1-induced changes in Cav3.2 channels could relieve pain. But targeting this multi-step pathway for pain relief may take some finessing. After injury, IGF-1 promotes tissue repair—a good thing for painful conditions resulting from nerve damage or inflammation. Limiting IGF-1’s pain-promoting effects on Cav3.2 channels would have to spare this repair function. “If the pain pathway bifurcates from the repair pathway, then you might have a point of attack further down the line that could allow you to selectively disable the pain pathway,” Zamponi said. First author Yuan Zhang and colleagues found that the IGF-1-induced increase in Cav3.2 currents stemmed from a rise in the threshold needed to turn off the channels. IGF-1’s effect was mediated by IGF-1 receptors, which doubled their density in mice with chronic inflammatory pain induced by injections of Complete Freund’s Adjuvant (CFA) to the paw. IGF-1 receptors were found in 93 percent of all Cav3.2-positive neurons, making the receptor a readily available modulator of Cav3.2 activity. The researchers next methodically picked apart how IGF-1 receptors connected to Cav3.2 channels and found an unexpected route. 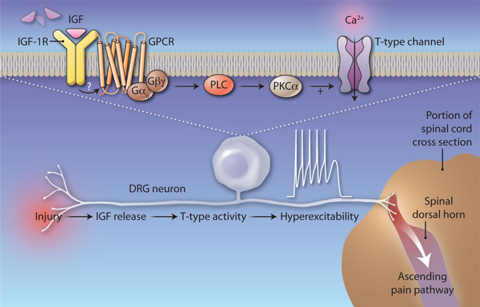 IGF-1 receptors are tyrosine kinases, which, when activated, typically kick off phosphatidylinositol 3-kinase (PI3K) signaling. Blocking this pathway, however, did not interfere with the ability of IGF-1 to enhance Cav3.2 currents. Instead, the researchers found signs of a G protein’s involvement, specifically Gαo, followed by a Gβγ-dependent activation of protein kinase C alpha (PKCα). IGF-1 receptor activation led to movement of PKCα from the cytosol to the cell membrane, where it could potentially phosphorylate Cav3.2 channels. Exactly how IGF-1 receptors trigger G protein signaling remains unclear, but it may involve another signaling pathway, or maybe a direct interaction between the IGF-1 receptor and an as yet unidentified G protein-coupled receptor. In mice, the hypersensitivity to touch and heat brought on by IGF-1 injection into a paw could be attenuated, but not abolished, by pretreatment with Cav3.2 blockers. This suggests there may be additional pain-promoting molecules recruited by IGF-1 receptor activation. Still, in mice with chronic inflammatory pain, blocking IGF-1 receptors did not significantly diminish hypersensitivity further than that already achieved by Cav3.2 channel knockdown with RNA interference. This provides reassurance that IGF-1 and Cav3.2 channels act in the same pathway. The pain relief from blocking IGF-1 receptors was quick and short lived, apparent at 30 minutes and gone at three hours. Despite this efficacy, the IGF-1 receptors themselves may not be the best therapeutic targets, because they sit too far upstream of Cav3.2. A more pain-specific approach may be to interfere with the enzyme acting on Cav3.2 channels—more work will be needed to figure out whether that enzyme is PKCα or some other intermediary. “I would think getting as close to the end effector as possible would be the best strategy,” Zamponi said. Image: Adapted from Stemkowski and Zamponi, 2014. Reprinted with permission from AAAS. Peripheral pain is enhanced by insulin-like growth factor 1 through a G protein-mediated stimulation of T-type calcium channels. The Tao of IGF-1: Insulin-Like Growth Factor Receptor Activation Increases Pain by Enhancing T-Type Calcium Channel Activity. I read the paper by Dr. Zhang et al. with great interest. They showed IGF-1 augments T-type calcium channel activity in the DRG neurons to produce pain hypersensitivity. While discovered as a growth hormone, IGF-1 is synthesized in the peripheral tissue and is involved in the maintenance of the skin homeostasis. IGF-1 production is increased after tissue injury and facilitates tissue repair. We previously found that local IGF-1 levels increased after the plantar incision, and blocking IGF-1 signaling reduced pain hypersensitivity due to the tissue injury (Miura et al., 2011). Dr. Zhang et al. provides important evidence about the relationship between IGF-1 and the nociceptive function of the peripheral nerve. IGF-1 augments T-type calcium channels via the IGF-R/G protein/PKC pathway. As expected from the mechanism, local IGF-1 treatment showed immediate and transient pro-nociceptive efficacy. This result is different from our observation that IGF-1 promotes long-lasting pain hypersensitivity associated with PI3K/AKT activation. I consider that the discrepancies could be due to different amounts of IGF-1 injected. As I mentioned above, IGF-1 exists in the peripheral tissue in the naïve condition and undergoes dynamic regulation by tissue injury, skin irritation, aging, and systemic disease including diabetes mellitus. Further studies will determine the role of tissue (and circulating) IGF-1 for controlling nociceptive activity of primary afferent neurons in various physiological/pathological conditions. The study by Zhang et al. is exciting to me for two reasons. One is that it confirms that T-channel modulators play a prominent role in shaping nociceptive signals from periphery to the spinal cord. Second, it clearly implicates G protein signaling as an important factor in controlling the function of Cav3.2 channels. Many previous studies using recombinant Cav3.2 channels have suggested such a possibility, but to my knowledge there were no conclusive experiments in native cells. Moreover, the authors nicely incorporated both G protein and PKC signaling in the concept of nociception. Hopefully, future in vivo studies will confirm these exciting findings. Calcium-permeable ion channels in pain signaling.